If you stood the blade on end, it would be about as tall as a 10 story building! These are all over Denmark, and yes, they are HUGE! 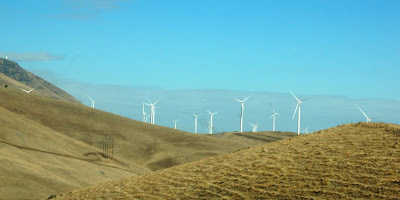 I love driving past these along I-90! Oftentimes we'll see massive trucks hauling bits and pieces of them. These suckers are huge! The Philistians are coming! THe Philistians are coming! When Scott and I we're little, we'd drive past hundreds of these as we went over the mountains to pick peaches every August. One year we must have just been told the story of David and Goliath because Scott immediately started calling them Philistians, since they looked like they were lining up to battle/taunt the Israelites. Thanks for the fun comments! These particular ones are new since the last time we drove and much closer to the highway. Very fun to look at!